When I built my '74 chrome bumper MGB V8 conversion about 10 years ago, it was on even less than a shoe-string budget. I assembled the least expensive cooling system that I believed would still do the job. The goal was to use a stock MG radiator, without modifications. This would both keep the original installation costs down, and would also make replacement easily available if a mishap occurred on a trip. Somewhat to my surprise, the system has afforded excellent performance for all these years. I have never experienced an overheated engine, even during a sweltering summer afternoon stranded in a Washington DC traffic jam when other MG V-8's were dropping by the wayside. The engine mounted fan keeps the temperature in the correct range over most operating conditions, with the electric back-ups only kicking on in traffic jams or if the motor is left idling for extended periods. Radiator - Stock 1975 MGB. Was cleaned, pressure checked and the tanks painted before installation. There were no modifications. 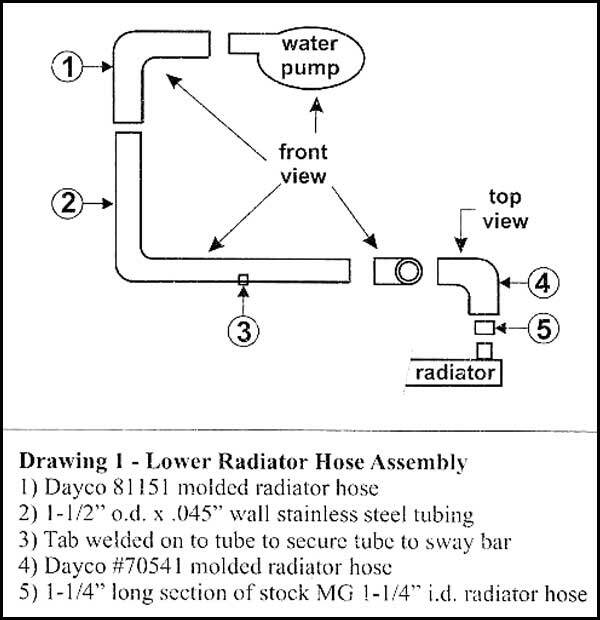 Hoses - 1.5" molded radiator hoses per drawing 1. Where the 1.5" i.d. 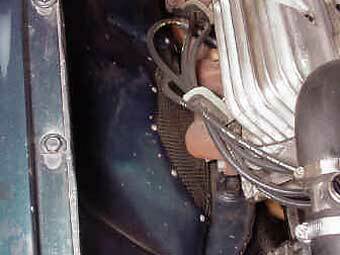 hoses were fitted over the MG radiator's 1.25" o.d. inlet and outlet necks, a 1.25" long piece of stock MG radiator hose was installed over the necks to bush them up to match the molded hose i.d. Filler Tee - To avoid air locks and to prevent air entrapment in the cooling system, the fill point has to be the highest point in the system. 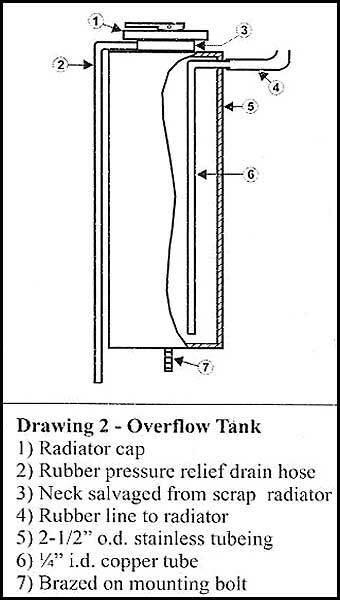 If the top of the radiator tank happens to be higher than the thermostat housing, a filler bung installed in the tank will work well. However, in my installation, the upper radiator hose was the highest point in the cooling system. I fabricated a filler tee by drilling a 0.5" diameter hole in the side of a 1.5" o.d. long section of stainless tubing. A stainless half coupling (female threaded pipe section) was then welded over the hole and a pipe plug wrapped with Teflon tape and installed. To fill the system I merely removed the pipe plug and slowly poured in the antifreeze. 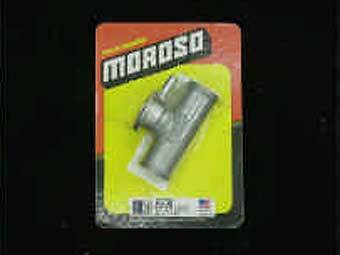 An easy alternative to the fabricated tee is a Moroso P/N 63730 top radiator hose tee with capper Photo2. Overflow Tank - I have a fetish about keeping the engine bay as uncluttered as possible. Therefore I did not want to hang an overflow tank anywhere where it could be easily seen. The solution was another fabrication per drawing 2. The tank was installed on the passenger side and in front of the radiator support panel. The cap is easily accessed, but the tank is pretty well hidden from view. Mechanical Fan - From a swap meet, I obtained a generic aluminum aftermarket fan. The fan diameter was a couple of inches too large and the blades interfered with the radiator necks and the hood. After a quick measurement, a compass was used to draw a smaller diameter on the blades. A three inch pneumatic cut-off wheel made short work of reducing the blade length. When performing this operation, it is imperative that the cuts are concentric and centered on the fan hub. An out-of-round blade will quickly chew up the water pump bearings. Electrical Fan - I mounted two stock late model MGB electric fans in their normal position under the slam panel and installed an OEM mesh guard over the blades. 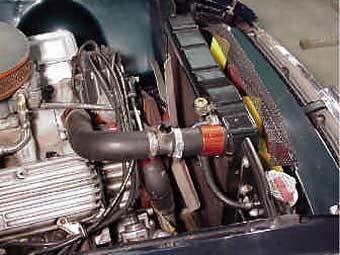 The fans were wired into the MG thermostatic switch mounted in the top radiator tank using a late model MG wiring diagram and relay. The only alteration was the addition of a toggle switch on the dash so that the fans could be turned on manually. This was to allow triggering the fans ahead of time if a traffic jam loomed ahead. Air Ducting - When converting a chrome bumper MGB, it is usually necessary to dish the inner fender panels to allow for header or exhaust manifold clearance. This dishing was provided by the factory in all the rubber bumper cars. Despite careful application of a bodyman's dishing hammer and hours of tapping, I ended up with the proper dish depth and configuration. However, the metal was criss-crossed with wrinkles and creases. I was afraid of laying in a layer of Bondo, as the heat and vibration would quickly cause it to crack and fall away. I firmly believe that these ducts are one of the largest reasons for the engine running cool. With the relatively large V8, steering gear and exhaust headers, there is an easy flowpath for hot air to exit the engine bay. The ducts help considerably in allowing air to move quickly out from under the hood. In addition, the wheel wells are actually low pressure areas when the MG is underway. This condition actually "vacuums" the hot under hood air through the ducts and out of the engine bay. Several other MG V-8'ers have ducted their engine bays in a similar manner and report significantly cooler running.